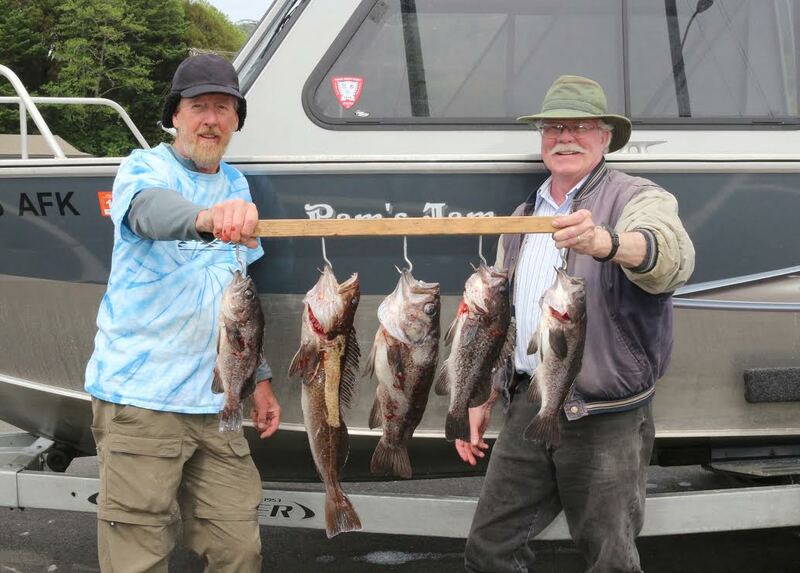 Dave Shough and John Savage from Brookings were fishing aboard 'Pam's Jam' last week when they caught rockfish and lingcod outside the Port of Brookings Harbor. Last week, angers caught a variety surfperch including redtails, striped and calico surfperch. I even saw one group of anglers who had a bucketful of shiner surfperch. But the largest and the most-esteemed food fish of the surfperch kingdom is hands down the redtail surfperch, which last week achieved sizes up to 3 pounds. Surfperch give live birth to miniature replicas of the parent which when ready to be expelled by the adult, are about 1-1/2 inches long by 1 inch high and look exactly like the parent surfperch. The great thing about the surfperch fishing is that the babies are very small and immature, demonstrating that the southern Oregon area should be experiencing great surfperch fishing well through the month of July. My personal opinion is that surfperch bite the best within one hour before high tide on the incoming tide. Timing of your cast is very important. I prefer to deploy a wait-and-cast procedure. Waves will come onto the beach in sets. If you count the waves coming onto the beach you will notice that they will build in size and increase in numbers for a short period of time and then the waves will gradually get a little smaller. One of these wave growing-and-abating procedures is called a set, and a set cadence is very reliably repeatable, set after set. After the weakest wave of the set comes in, the ocean will appear to get a little calmer. It is during this weakest part of the set when I will choose to make my cast. For the next 10 days, incoming high tides are going to be favoring hours that are perfectly suited for surfperch fishermen in southern Oregon. Remember to get to your surf fishing spot two hours before the incoming tide in order to catch the best-possible tidal window in which these fish are going to bite the best. Each successive high tide will hit the beach between 40 minutes and 45 minutes the day after the next high tide peak, also called high slack. Here are the high tide peaks for the next 10 days for the Brookings area. Saturday, June 10 - 1:55 pm. Sunday, June 11 - 2:34 pm. Monday, June 12 - 3:14 pm. Tuesday, June 13 - 3:55 pm. Wednesday, June 14 - 4:38 pm. Thursday, June 15 - 5:22 pm. Friday, June 16 - 6:07 pm. Saturday, June 17 - 6:52 pm. Sunday, June 18 - 7:37 pm. Monday, June 19 - 8:23 pm. All surfperch will bite raw pieces of shrimp the best. I like to buy the Kroger frozen bag of whole raw shrimp that are 51-60 to the pack. For about 7 bucks you can have enough shrimp for at least 3 to 4 outings. Normally, cut one-quarter to one-third of these little shrimps and bait them onto a number 6 snelled baitholder hook. But if I am at a location that is known for the larger surfperch, I will use half of the shrimp on a number 4 hook. I will peel off all the outer shell and then spear them onto the hook, throwing a few wraps of Miracle Thread on the shrimp to keep it on the hook for more casts. I prefer pushing part of the shrimp over the eye of the hook before throwing on my first wraps of the Miracle Thread, making sure to wrap the upper part of the shrimp onto the hook eye. I also like to leave the very last portion of the hook tail on the hook to give it a more lively appearance. If I am specifically targeting the larger redtails, I will use the lower three quarters of the shrimp. These large surfperch are not afraid of gulping down a larger hook with a larger piece of shrimp to match. On the end of your 20-pound monofilament mainline, tie a loop which will be used to loop through the eye of your sinker which will range from 3 to 6 ounces. About 20 inches up the line, tie on a size 8 three-way swivel. Tie another three-way swivel another 20 inches up the line from there. Thread the loop of your snelled leader through the part of the swivel that sticks out 90 degrees, bait up and make your cast. Larry Ellis, author, writer, columnist and photographer has had a 50-year passion for fishing in California and Oregon's saltwater and freshwater venues. He is a well-known writer for Oregon, Washington and California Fishing and Hunting News, Northwest Sportsman, California Sportsman and Pacific Coast Sportfishing. He currently writes monthly for Salmon Trout Steelheader Magazine, and is the weekly fishing columnist for "On the Water" for the Curry Coastal Pilot Newspaper. He particularly loves living in his hometown of Brookings, Oregon - The heart of salmon country and gateway to fishing paradise. Posted with permission of the Curry Coastal Pilot of Brookings, Oregon.